Covertex are proud to announce that they have been selected as a winner of the Humanitarian Supplies Challenge for their Transportable Tanks & Flexible Drums within the ‘Access to clean water’ category. 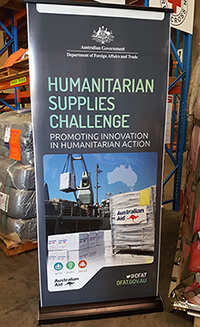 The Humanitarian Supplies Challenge is an initiative of the Australian Government’s innovationXchange, designed to identify new and innovative humanitarian relief supplies. The challenge sought solutions to improve the effectiveness of humanitarian aid in delivering clean water, off grid energy supply and safe and temporary shelter. The challenge received 77 applications from 12 countries with 13 innovative products selected to assist in humanitarian crises. The Humanitarian Supplies Challenge winning products will improve the lives of people in our region affected by natural disaster and other humanitarian crises. 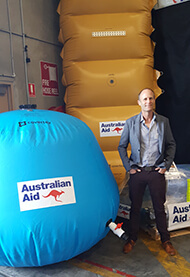 The new products will be tested when the Australian Government responds to crises and those that prove effective will be added to their humanitarian supplies stores. The Covertex range of tanks and drums are manufactured to ISO9001 standards from specialised fabrics, enabling reusable, large-capacity transport and storage of potable water. Lightweight and quick to deploy they are available in a range of capacities from 1,000 to 10,000 litres. Flexible Drums – the vertical shape of the drums enable increased storage volume over a small footprint as well as increased pressure outlets. Transportable Tanks – engineered for transportation on light commercial vehicles through to flat deck trucks. The design also incorporates an internal structure controlling the shape of the tank and prevents large surging or movement of fluid. For 30 years, Covertex have been designing and manufacturing engineered fabric solutions for rapid deployment and fluid containment. Covertex solutions are used in over 20 countries by emergency response and humanitarian agencies including St John, New Zealand Fire Service, New Zealand Police, Queensland Ambulance Service, NZ/Australian/Taiwanese and Malaysian Hospitals, Singapore Civil Defence, New Zealand Red Cross and recently NZMAT.